force gage or as a digital controller for use with the FMM Digital Force Testers. The DFC can serve as a universal interface where you set up your tests and where you configure load limits, distance limits, break limits, crosshead travel direction, crosshead speed and more. The DFC features a measurement accuracy of 0.1% full scale with internal data sampling at 25kHz. Display resolution is 10,000:1. The DFC features Bluetooth®, USB and RS-232 communications plus digital I/O. Cyclic Duration, Max. 27 Hrs. Hold Duration, Max. 27 Hrs. Machine control is exclusive to the Starrett DFC. 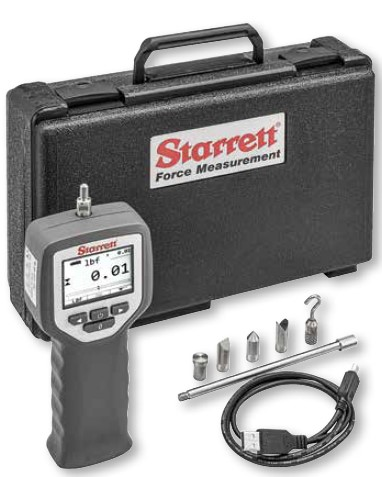 When connected to the Starrett FMM digital force tester, configuration of force gage and tester is performed through the gage. NOTES Load measurement accuracy is ±0.1% of load cell capacity. Display resolution is 10,000:1.